Chop onion and place in microwave dish. Add butter and cover with plastic wrap. Cook in microwave on high for 1 and 1/2 minutes. Set Aside and let cool. Chop ham into 1/4 inch bits. 1/3 of the cheese, 1/2 of the onions, and 1/2 of the ham; repeat layering, ending up with cheese on the top. Mix together cream, eggs, mustard, salt and pepper until well blended. Slowly pour custard over quiche. Kathy, I always thought quiche would be impossible to make. You’re demystifying all my favourite dishes. Thank you! A quiche is one of my all time favorite dishes to make, and eat! I often sprinkle a few caraway seeds on the onion layer of this quiche. They add a really nice flavor! I was experimenting with a vegan version of this, using as a replacement for the custard tofu, soy milk and cornstarch as a thickening agent. With a handblender, I whipped the tofu and soymilk into a thick cream, to which I added some carmelized onions, sauted vegatables and a bit of vegetable stock powder. I added a couple of teasoons of cornstarch to make it set when it cooks. threw it into a pie shell and it worked ! I cooked it for about an hour at 350 and it came out golden brown and holding its shape. Ironically I later discoverd that the pie shell was made of beef fat. Will your recipe sounds great! I have been experimenting more and more with tofu. Much to my surprise, and my husbands, you can do some amazing things with tofu! 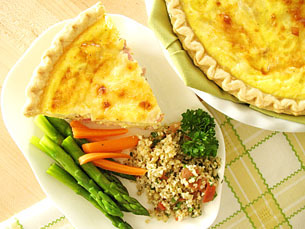 In the photo of the my Quiche I am serving it with Taboule, and steamed vegetables. Fruit Salad or a Vegetable Salad would also work quite well. Good Luck and be sure to let me know how it turns out! Hello, I just wanted to ask a quick question. If I wanted to add frozen spinach to this dish, which step would I do that?? Thanxks! Frozen (chopped) spinach would be a great addition to this recipe! Defrost it and totally squeeze out all the excess moisture (the way I did it in the Lasagna video). Then divide it in two and spread it out between the cheese layers. PS…..The roasted chicken yesterday was a smashing success!!!! Thanks! Hi Cynthia, All cheddar cheese will work just fine! I’m delighted to hear about the Roasted Chicken! Is the cream that is poured in this quiche same as milk? Is it English or French mustard that you used? Are there any 2 different cheeses that I can mix instead of gruyere & provolone cheese? 2 weeks ago I tried the lasgna! Was amazing! Even my girlfriend didn’t expect that would taste so amazing! Mum also liked it and I took a piece at work for lunch, colleagues were surprised how nice it look! I also tried the Grilled chicken indoors! Same great meal/taste! Thank you so much for your fabulous recipes and videos that help me so much in cooking! Light cream contains about 20% fat. Whole milk will work in this recipe as well. I like to cook with French style Dijon mustard. Cheddar cheese and or swiss cheese tastes great in this quiche. It is great to hear that you are learning how to cook from my videos! You should not EVER cook with ready made crusts. They are full of trans fats, which have been proven to be very unhealthy. I would love that you give us a recipe to make your own crust, like you did with the chocolate pancakes. Hi Alan, I agree, trans fats are really bad for you. You can now buy many different brands of frozen pie crust without trans fats. Be sure to check the label on the package before buying the pie crust. Your videos are *wonderful* I am so impressed and will add your blog to my recommended list. You sold me in just 2 posts! Thanks! The videos and the photo-tutorials are great fun to make (and eat!). I made the ham and cheese quiche, and it turned out great! My only question is….I’m wondering why there was a a lot of juice/liquid at the bottom on the pie crust pan. How can I minimize that? I’m thinking that perhaps my onions (sweet instead of yellow) were microwaved with too much butter (used a little more than you did) or perhaps using mozzarella cheese perhaps did it, since that kind of cheese (even shredded) is a little bit more watery. Thanks for your help! I’m making it again for a holiday party this friday, so I hope to hear back from you soon! 5 years in College… how have I only found this site now!!? I have 60 videos and over 250 photo-tutorials for your viewing pleasure! Love your videos! I am hooked on them!! Another great recipe. Thank you for showing me how to make quiche! It is delicious! I make one for myself with ham, and the other with mushrooms for my parents. We all look forward to quiche night! Quiche is one of my favorite things to make! I’m delighted to hear you like this recipe. One variation I love is to add a sprinkle of caraway seeds into the mix. It adds a wonderful flavor!